Part of travel is not knowing exactly where you're going or how you'll get there. But hoping that when you do get everything figured out, the journey will be as spectacular as the destination. 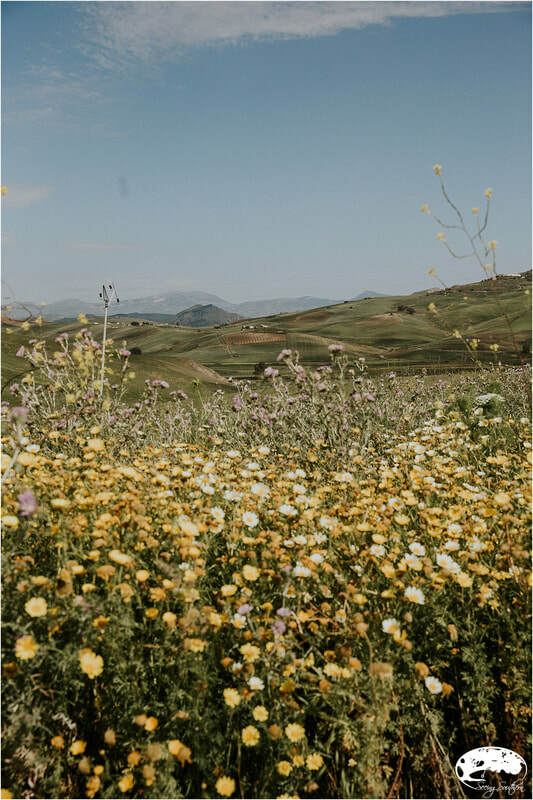 Getting to Sicily and then navigating through the country was definitely eye-opening. A struggle at times, but always educational. Yes to the rental car. But first, a train whisks us from Salerno (90 minutes south of Rome) to Taormina, a city on the northeastern coast of Sicily. The almost 10-hour excursion was a lesson in patience and train travel. Remember: always choose the first class option; it's quite affordable in Europe and much more comfortable. Pack a lunch; no food car here. For this journey, reserve seating on the right side of the train for the sea view - still not sure how we missed that one, but with an almost empty car, we roamed. We watched a series of skylines pass by at high speed, and also, olive groves and very few vineyards. 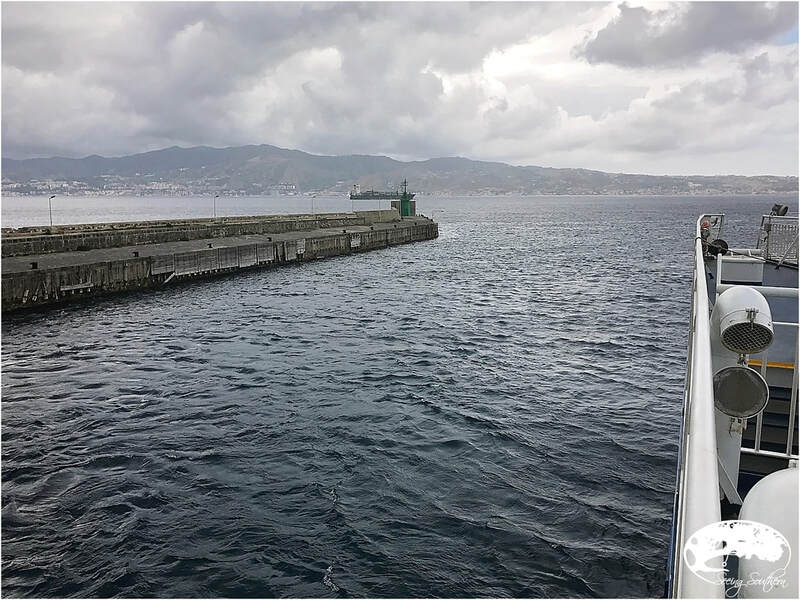 The mystery peaked as we arrived at the Strait of Messina, a narrow passage between the eastern tip of Sicily and the western tip of Calabria in the south of Italy. It connects the Tyrrheanian Sea (north) to the Ionian Sea (south). We're on a train; there is no bridge. The solution to the crossing is the same as it has been for many years. 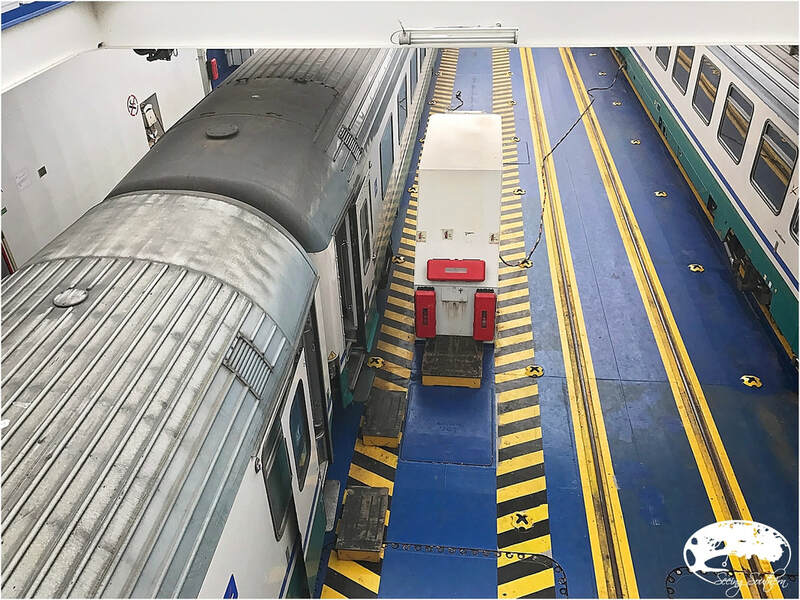 Break the train down, load it onto a ferry, sail across the strait and reverse the process on the other side. A bridge has been proposed and debated for years but for now, under the warm Southern Italian sun, a slower means of accomplishing the same task seems somehow appropriate. For Len, this was as good as Christmas. 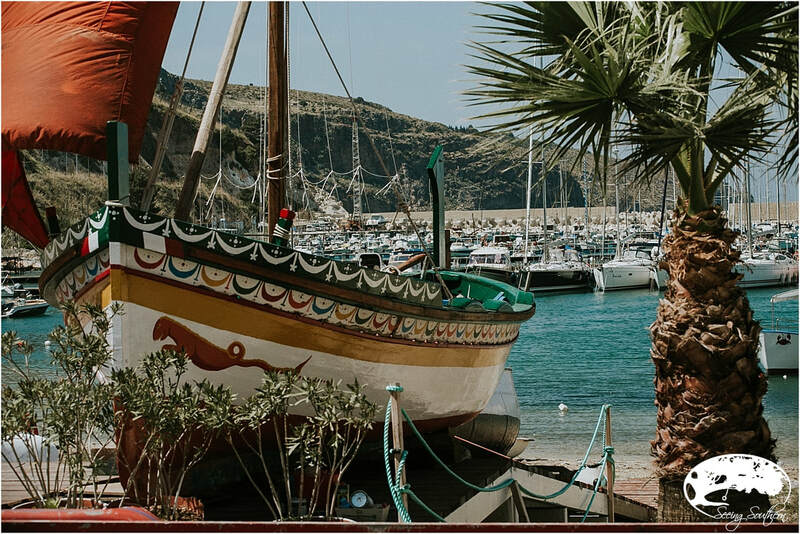 Our time in Sicily was scant - moving quickly from town to town - inhaling a breath of each city on our list, and at least to say we had visited if only for a second. 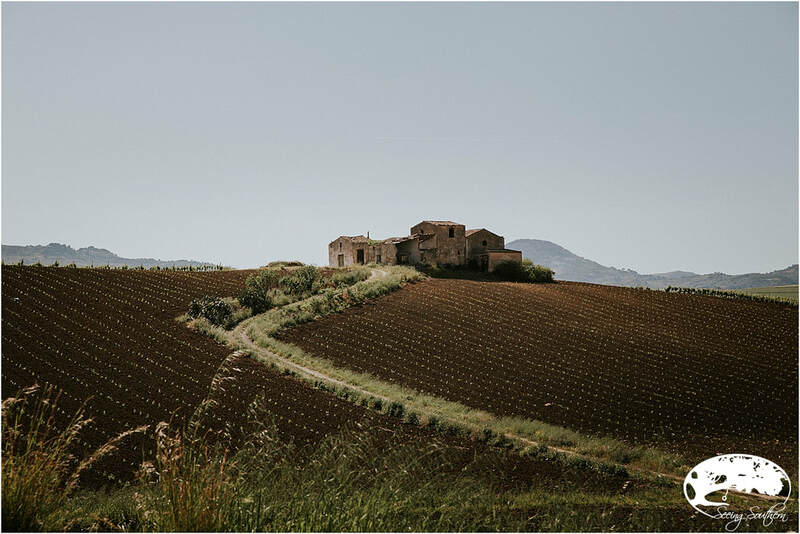 It provided a taste and climate for future travels, one that will definitely include more time dedicated to Sicily, the Godfather trail and the Nero d'Avola wine. 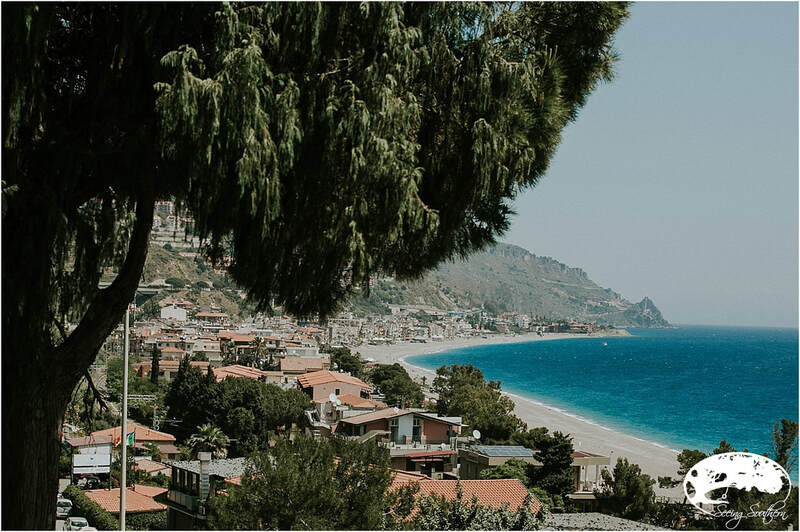 Taormina (eastern coast of Sicily) is the most visited and exclusive tourist towns on the island, exuding old world charm, grand hotels and ancient Greek traditions. Once the retreat of Oscar Wilde and D.H. Lawrence, the town on a cliff retains much of its medieval character - and price tag! In the middle of the Ionian coast, with Mount Etna in the distance, Catania is a major port city with a thriving commercial district. Its busy with people pouring onto the streets that are lined with cars. Its most iconic landmark, Piazza del Duomo, a Baroque piazza rebuilt completely in the first half of the 18th century by Giovanni Battista. The Duomo (middle photo left) is representative of the original cathedral that was founded here in the 11th century. What you see today is all that survived the 1693 earthquake. Everyone told us of the fabulous street food scene in Sicily. Forget the restaurants, grab food on the go. It's a hit in Palermo. Here in Catania, people walk around with handfuls of goodness. They parade around with nougat (torrone), marzipan and sweet ricotta (small cakes), soda water with lemon and delicious arancini (rice balls, above). The rice balls (texture and richness are like a ball of cheesy risotto) are quick, hearty and filled with broccoli, cheese or meat. One of the largest volcanoes in the world, it surges over the eastern landscape of Sicily. Etna (a UNESCO World Heritage Site) was one of the places that the Greeks and Romans thought to be the forge of Hephaestus or Vulcan. Remember your mythology? Hikers still take risks and head to the summit; the two main approaches are from the north and south. Ascending the volcano is only possible May through October when its not covered in snow. It is still strictly controlled and watched for volcanic activity. You can go on your own or through an organized tour; scheduling through your hotel is often the easiest. 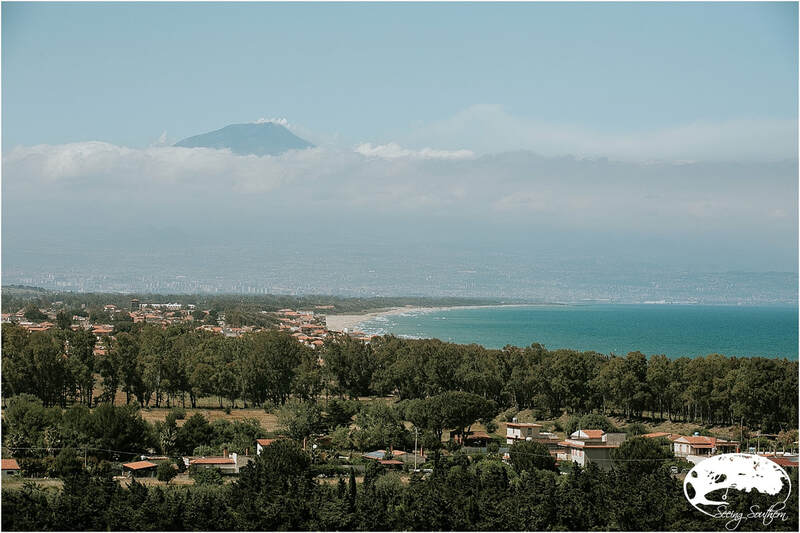 If you're doing a quick drive-by like us, Mount Etna won't disappoint as she peaks through the clouds. There's actually something rather majestic seeing her from a distance, almost as if she's pointing the way. The Autostrada directional sign signaled Lentini. I said turn, "take this exit." Leaving Catania and heading toward Syracuse, midway, we see Len's family's name plastered on a road sign. Now, whether or not any of his family came from this little pit stop, we have no clue. But we can now say we have been there. Len sat on the bench. He cuddled with the statue of the town's namesake. We couldn't afford to risk it being something and do nothing. So for the time it took us to go in and turn around, we were in Lentini. It is in the sea side city of Siracusa (a UNESCO World Heritage Site) where you find the heart of the Mediterranean. There are monuments dedicated to diversity: Christian, Renaissance, Baroque. 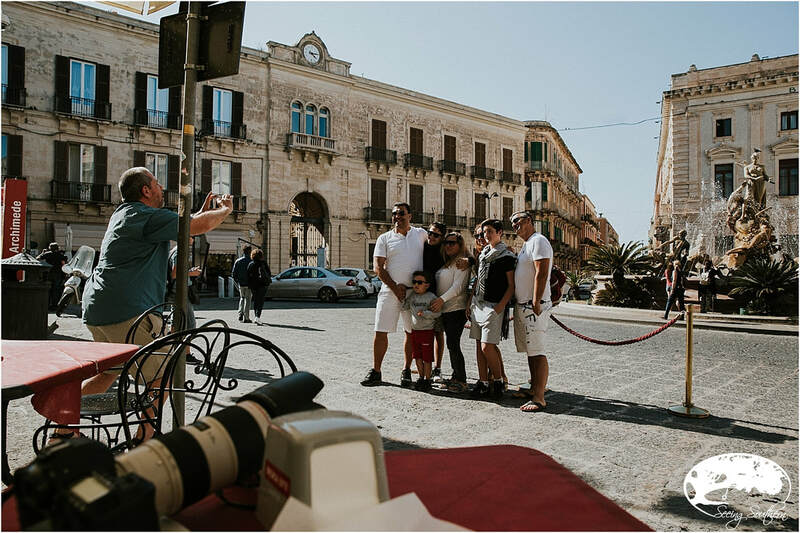 Ortigia (cross the bridge to the south of the main city) is where most tourists find themselves, admide the mansions, palaces, cafes and historical artifacts. 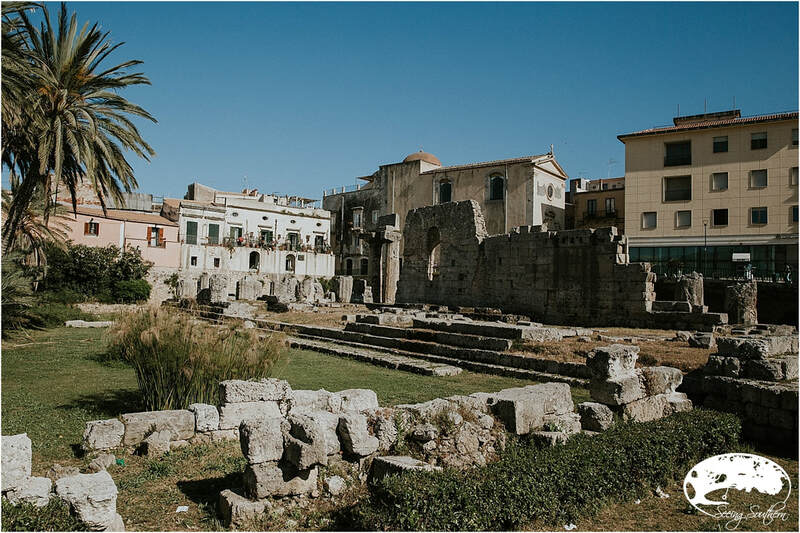 One such place, the Tempio di Apollo (last photo); it is thought to be the first of the great Doric temples built in Sicily in the early sixth century BC. Only portions remain which are surrounded by modern office buildings; at its peak, a double row of columns (of which on a few remain) magnifies its importance. Parking in Siracusa: don't. Or the lesson here, how the Sicilians make a mint from towing tourists illegally parked. 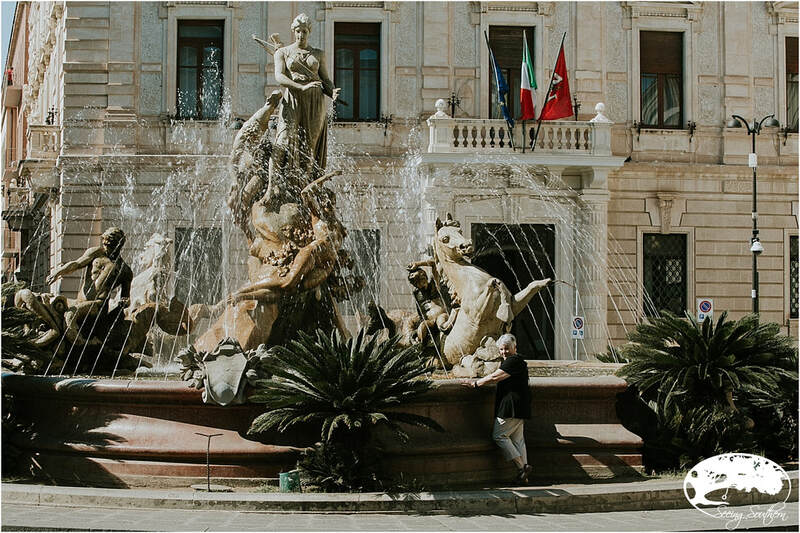 The fountain of Diana - goddess of the hunt - located in Archimede Square was created by Giulio Moschetti (1847-1909). From Siracusa, we head toward Agrigento along the southwest coast. Its most appealing feature, Valle dei Tempii (Valley of the Temples, a UNESCO World Heritage Site). As most guide books will tell you, no one comes for the city; they come for the temples. 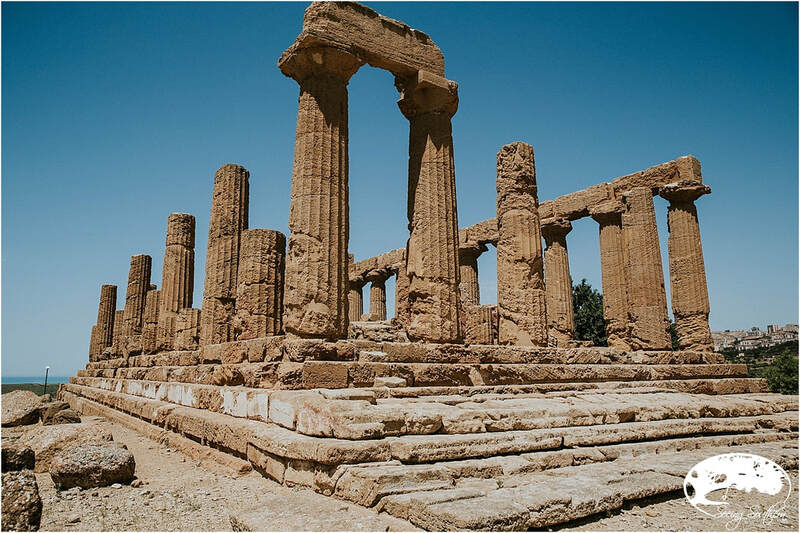 The Valley of the Temples is Sicily's most well preserved Greek artifact and the largest archeological site in the world. Rising above the coast, it was once a beacon of wealth and richness of the city of Akragas during the fifth century. Most impressive, Tempio di Giunone (Temple of Juno/Hera) which only has a few columns remaining; Tempio della Concordia (Concord) which dates from around 430 BC which is amazingly intact thanks to those who converted it into a Christian church in the sixth century; Tempio di Ercole (Hercules), with nine of its original 38 columns standing. The Valley of the Temples is open daily. Entry fee is 10 euros. An audio tour is available as well as vendors selling maps. If you drive, parking is very close to the entrance gate, but hard to find. Ask locals for directions that wind through the small neighboring town. Go early to avoid the crowds and the heat. Even in May, it was sweltering. Be prepared to have your bags searched. As it is here in America, getting from one major city to the other requires traveling the Autostrade (our interstate system). However, traveling from Agrigento to Castellemmare del Golfo, our GPS took us down some cow paths (as Len loves to call them). Cow paths deliver insights and some of the best experiences; don't forget that. Having been in the car way too long, we pull over to the only bit of civilization we come across - Coffee and Go. Kind of like the Golden Pantry where you can find a little bit of everything under the sun. We are there along with a tour bus filled with Italian tourists and locals taking a break mid-day. The lady swishes a cloth over the counter, cleaning the spills of the previous patron; we order two cappuccinos. In a flash, they are handmade, served to us in a porcelain cup and saucer. We take them to the only vacant table, and Len and I look at each other is amazement. We're drinking freshly made cappuccinos out of porcelain cups while next to us, two Frenchmen are shouting and laughing together, while at the counter, Italian tourists order endless espressos and cappuccinos. This is not your average Golden Pantry. I notice this is the first time during our trip that I see another woman with white hair like mine. I am not the unique one in this spot. People are in a hurry to get in, but never in a hurry once they are there. And when its time to leave, hurry takes over again. Even here, I find porcelain. I like that. It's cow path time again. We're on our way to Castellemmare del Golfo. Our final stop through Sicily, the birthplace of Len's family . . . Castellemmare del Golfo. 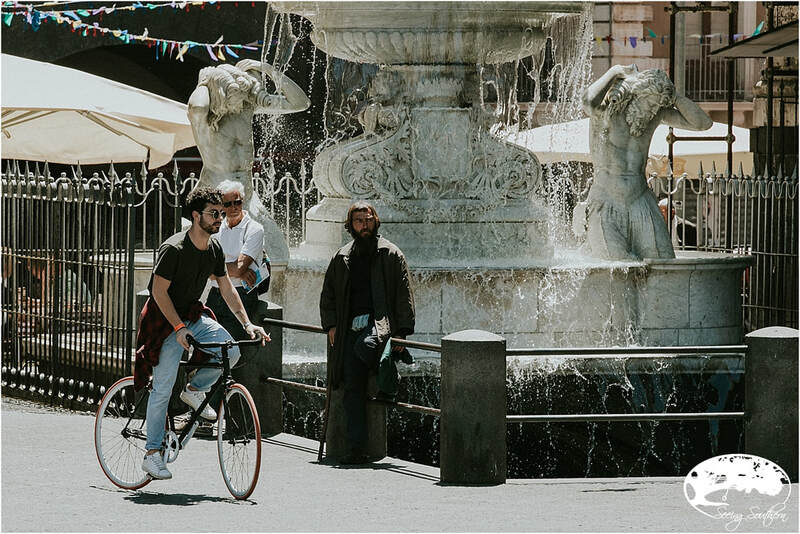 Catania: Near Mount Etna, bustling commercial town. Eastern Sicily. 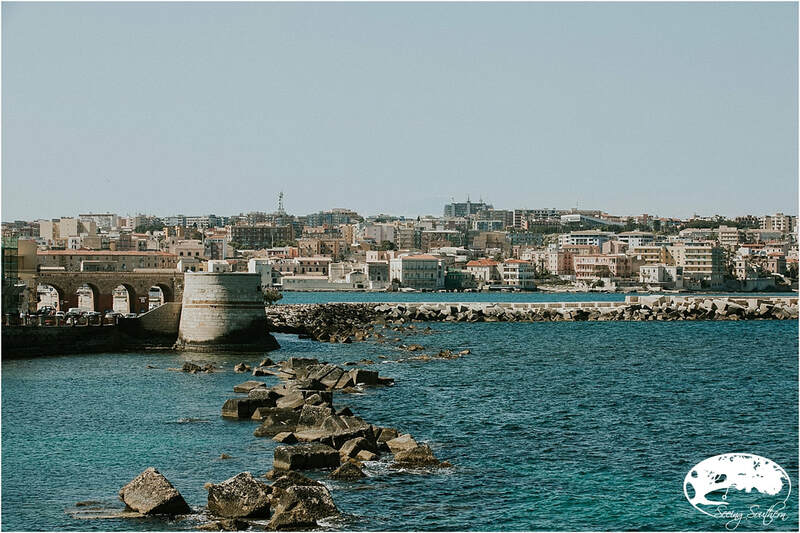 Siracusa: Southeastern coastal town in Sicily. Agrigento: Southern coast of Sicily. 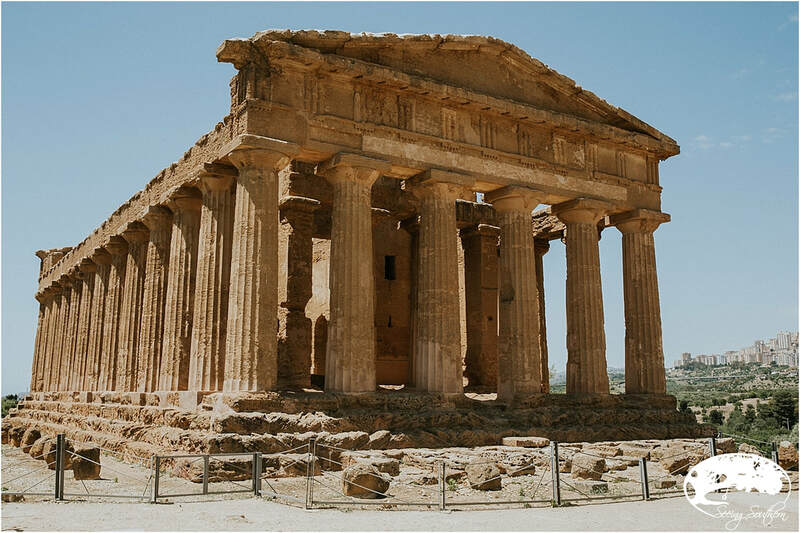 Valley of the Temples: In Agrigento, historical archaelogical site. Scala dei Turchi Resort: Agrigento lodging, new and fashionable resort with sea view; great food; not within walking distance of town. Junior Suite, $104 euros booked last minute with HotelTonight app. Trenitalia TrainTravel: purchase tickets prior to travel to save money and time.